Welcome to an alternative Marvel Universe set in the dark gritty world of hard-knuckled detectives. It’s a grim take on the Roaring Twenties and Depression Thirties with tangled mysteries, flawed Heroes, corruption, betrayal, and moral grey areas. It’s a world immortalized by the Classic Marvel comic series that recasts their Heroes as unique Noir versions. 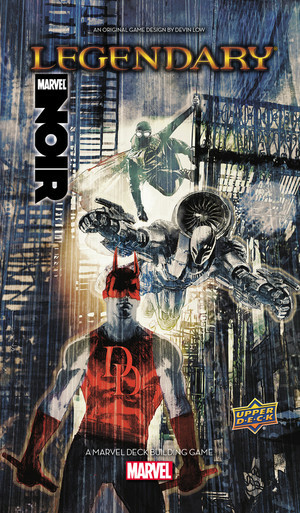 Welcome to Legendary®: Marvel Noir. This expansion consists of 100 all new playable cards and a Color Rule Sheet. The content consists of 5 heroes, 2 new villain groups and 2 Masterminds, and 4 new Schemes. Find all new original art featuring 4 pieces of unique art per hero! This is not a standalone product; a Core Set (including Villains) is required for game play.